Last year when our class was told that we would be seeing a kabuki performance outside Sakata, Yamagata Prefecture, I was not sure what to expect. I have seen traditional kabuki in Yamaguchi-ken three years ago and a more modern adaptation of kabuki at the Korakukan Theater in northern Akita. I was in for a real treat when I arrived to find children performing the roles of kabuki actors. 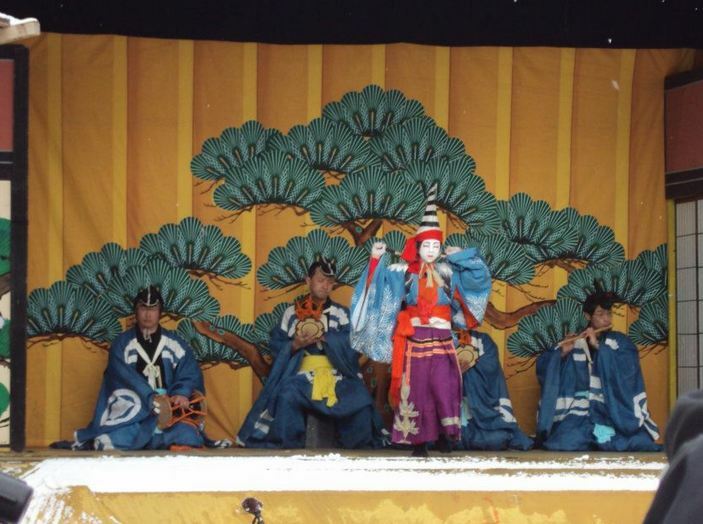 The annual performance is held at a local shrine with a specially built stage. Besides some adult musicians, everyone on stage was younger than their early teens. This annual event of children kabuki in the town of Kuromori is a rarity in Japan. We were told the children practiced for over a year to perfect this performance. With less than 150 people in attendance, I was skeptical how the day’s festivities would turn out. My first impression was we arrived late since there was someone dancing on stage. But something caught my attention: I remember reading that it is kabuki actors that use makeup and noh actors that utilize masks, so why was this dancer masked? I scuttled to my teacher so he can bestow his knowledge on me. My suspicions were quelled when he told me that because this kabuki performance was taking place at a shrine, an okina or sabatsu dance is used to purify the stage before the main performance. This is not done in most kabuki performances today. The performance was very professional, despite the young age of the performers. The Kabuki-za in Tokyo supports programs like these to preserve traditional arts in Japan and also to scope out new up-and-coming talent. The crowd was smaller than expected. While watching, I chatted up a local and tried my mediocre Japanese skills. The event has been going on for over 270 years. It is a living tradition. 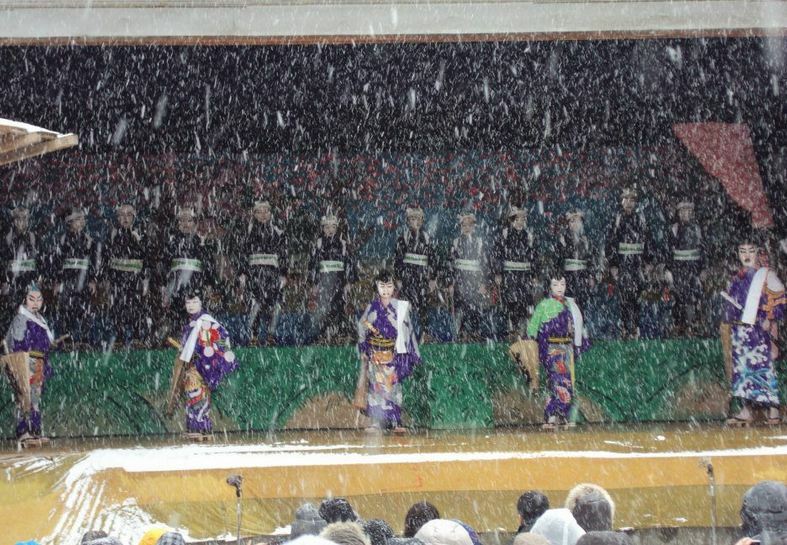 On the other hand, with it being the middle of winter, snowing, and located in rural Yamagata, the performance rarely draws large crowds. Though behind the audience was a long row of two dozen or so video cameras capturing footage. Some of the cameras showed signs of local or national (NHK) affiliation. This gathering was all about preserving tradition, so I joined some students in sampling the local amazake (sweet sake) and then the hot sake—to wash the sweet stuff down of course. While we were drinking, a hunched-back ojiisan (old man) penetrated our social circle to invite us to see the “backstage area” before the proper performance started. We took off our shoes and entered the shrine behind the main stage. 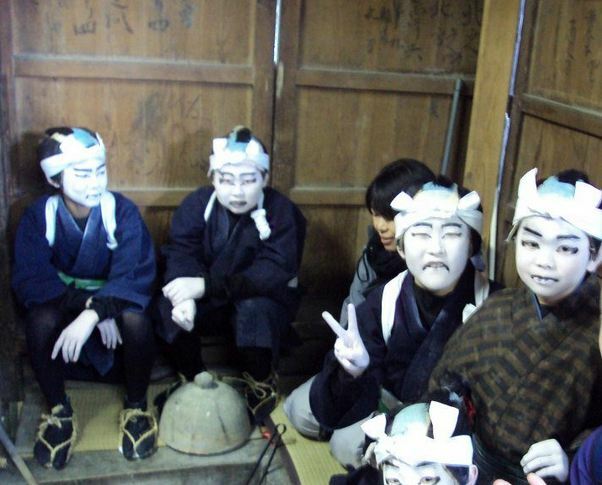 Everywhere were five foot white-faced demons, but they were actually children in kabuki makeup. Expressions are painted onto the kabuki makeup and the first bunch I saw looked angry. After a quick “Konnichi wa” I found out they were really nice. We continued past the prayer candles into what I labeled the “VIP Lounge.” Some village elders had invited us in for a drink (or three) and some nibbles to eat on. They told us we were dining with the gods, so it would have been very rude to refuse to participate. I obliged. I asked one of the coordinators of the event if the program is the same time every year. What I discovered (if I translated it right) was the priest makes three recommendations when the festival should be, but it is the gods that decide when the event is. We thanked our hosts and hurried back to the staging area to watch the play. The performance was spectacular. I still do not know how the children had voices so low and loud, just like the professionals. Performances change time to time. The performance I watched revolved around five bandits. A favorite scene of mine was when ten Edo police officers were fighting with the five gangsters. The fight is very stylized and full of dramatic poses. It looked like choreographed dance more than anything else. It was worth standing in the freezing snow. Watching kabuki with children made the performance cute, which is something traditional kabuki could never be. It was a wonderful experience learning the history and lore around the festival and seeing actors of a younger caliber perform and preserve this traditional art.